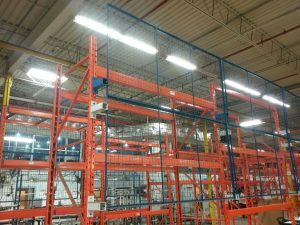 Safety Netting – Canadian Rack Inc.
Our Canadian Rack pallet rack safety netting and rigid wire mesh guarding systems offer a simple, affordable means of preventing packages and cartons that have become dislodged from the pallet, from falling onto workstations below or onto adjacent walkways or aisles. 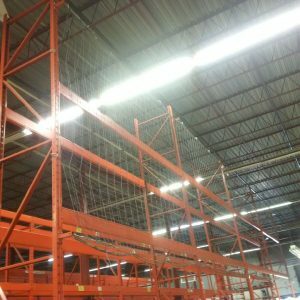 Safety netting prevents personnel from injury, keeps cartons from potentially jamming up conveyors and equipment, as well as helping prevent cartons from damage. Constructed of strong, durable, braided nylon rope or rigid wire mesh.